Radiosonde Replacement System (RRS) data at 1-second resolution for all stations from the beginning of the RRS program in 2005 to the present are now available directly from NOAA’s National Centers for Environmental Information at ftp://ftp.ncdc.noaa.gov/pub/data/ua/rrs-data/. MicroART data at 6-second resolution from 1998 until the time of transition to RRS for each station are available at ftp://ftp.ncdc.noaa.gov/pub/data/ua/data/6-sec/. Both RRS and MicroART data up to 2011 inclusive are also still available from the SPARC Data Centre as described below. 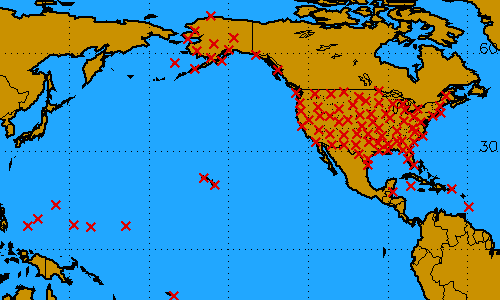 High vertical resolution radiosonde data (HVRRD) from US upper air stations are available for the period of 1998-2011. The data were obtained from the US National Oceanic and Atmospheric Administration (NOAA). Station locations are displayed on the figure below and a list of further station details can be found here. The data set spans a period during which NOAA progressively upgraded their upper air stations from the MicroART radiotheodolite tracking system to the Radiosonde Replacement System (RRS) which utilizes GPS tracking. Consequently each station data set transitions from the 6-second resolution MicroART format to the 1-second resolution RRS format at a specific date. Transition dates for each station are also listed in the station data list. Both 6- and 1-second resolution data are available on the ftp server at /sparc/hres/. Further information is available in the README file, or contact the SPARC Data Centre Scientist. The data were originally acquired for the SPARC Gravity Wave Initiative. Since being made available here, the data has facilitated research across a range of other fields. A list of references for publications in which the US HVRRD available here have been utilized can be found here. Links to HVRRD from other regions. During 27-29 May 2013 at Stony Brook University, New York, USA, 19 scientists from 9 different countries took part in the Workshop on Research Applications of High Vertical Resolution Radiosonde Data, sponsored by the US National Science Foundation and SPARC. For information on meeting outcomes, on going activities and science presentations please visit the workshop home page. Locations of US upper air stations. Please remember to send us a quick email with your feedback to gro.e1555899263tamil1555899263c-cra1555899263ps@ec1555899263iffo 1555899263. Thanks!